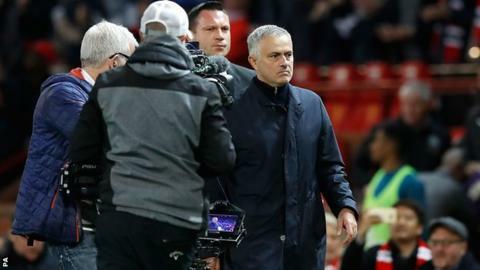 Manchester United manager Jose Mourinho will not be punished by the Football Association after the club successfully contested a charge that he swore in Portuguese during a win over Newcastle. The FA used a lip reader and his remarks were interpreted as offensive during the 3-2 victory on 6 October. But BBC Sport understands United produced a strong defence in its appeal and feel vindicated by the outcome. The FA is surprised by the outcome and has not ruled out an appeal. An statement from English football's governing body read: "A charge against Jose Mourinho for allegedly using language which was abusive and/or insulting and/or improper has been found not proven following an independent regulatory commission hearing. "Written reasons for the decision of the independent regulatory commission will be published in due course. This decision is subject to appeal." A TV camera filmed the Portuguese appearing to say something, and make a gesture with his right hand, as he walked off the pitch following his side's win over the Magpies. He faced a possible touchline ban if found guilty of the original charge.